9:00 Pulled onto Pine Lake Road West, then north on 14th Street. 9:06 Turned onto Old Cheney West through Wilderness Park. 9:08 Turning North on US-77 ... I still can’t believe that we are actually on our way, nor that Jo and Sam asked me to accompany them on this great expedition. 9:15 Joined into I-80 ... it is a cloudy day and it has just started to rain - wonder how much rain we will have during our trip! Everything is looking nice and green ... the crops are up. 9:32 Crops are already being irrigated with the big sprinkler systems, including the very fine sprinklers ... Jo and Sam have said there hasn’t been a lot of rain. 9:35 Big turkey farm (or chickens) to the right. 10:27 Right lane closed ... this is just before Grand Island for bridge work over the Platte River. 10:42 Lots of cattle to the south. 10:47 Sign: This road is built with 47,000 recycled tires ... old tires are ground up and mixed with asphalt. 10:51 Six llamas to the south. 10:55 Blue sky to the north ... also hay already cut and rolled. 11:01 Going under the Kearney Arch ... wire buffalo along the road to the arch. 11:05 Leaving the highway for the Kearney Westbound Rest Area. 11:21 Back on I-80 and almost immediately we start to see the sandhills to the north ... not too much blue sky. 11:37 Four mules to the right. 11:50 Passing the Lexington exit - Museum of Military Vehicles ... geese on borrow pit. 12:07 The rain seems to be setting in. 12:08 Crossing the Platte River Channel. 12:13 Platte River Channel again ... coal train ... also the sandhills are closer ... we are seeing lots of trains now. 12:22 North Channel Platte River. 12:58 There are sandhills immediately to the south ... leaving the highway for a Rest Area, the Sutherland Westbound Rest Area ... because of the rain we ate our lunch in the car - sandwiches made at home before we left. 1:35 Back on I-80 ... most of the time Sam is driving at 70 mph. 1:38 A wild turkey to the north ... it is not raining now! 1:40 Two flocks of pelicans. 259.1 1:44 Entering Mountain Time Zone, so now the time is 12:44. 12:50 Interesting sandhills to the north, not as smooth on top ... the land is slightly hilly to the south ... the road is following a valley. 1:03 Leaving I-80 at Exit-126 in Ogallala. 1:04 Crossing the South Platte River. The route through Ogallala has changed since I was last here. We have followed US-30 West before turning off for US-26. 1:08 Leaving US-30 and turning north for US-26 ... 123 miles to Scott’s Bluff. 1:10 Climbing into the sandhills. 1:13 Turning left onto the road along which we used to come ... purple vetch flowering in abundance. 1:18 Rain spitting lightly again ... grain crops well up ... no fences. 1:22 Big clump of Dames Rocket with a red-wing blackbird sitting on it. 1:35 Passing Ash Hollow Visitor Center. 1:36 Crossing the North Platte River ... pelican ... raining again ... goat farm. 1:42 A covered wagon, pulled by two mules, going in the same direction as us. 1:43 Stacks of beehives to the left. 1:47 Hereford cattle and lots of calves. 1:49 A large feed lot ... Oshkosh. 1:56 A huge feed lot to the right. 2:14 Rugged cliffs to the right ... cattle grazing. 2:29 Seven llamas and one donkey. 2:31 Starting to pass a coal train going east ... then two more coal trains side by side. 2:33 Crossing over the first train ... very, very long and still moving. 2:37 Feed lot to the left ... working oil pump to the left ... irrigation canal, full of water, to the right. 2:43 Ahead Chimney Rock is just visible through the mist. 2:46 Another coal train ... everything continues to be very green. 2:48 Leaving US-26 to continue straight ahead on NE-92 ... passing Chimney Rock. 2:55 Magpie ... Sam pointed out the concrete ties being used for the railway line. 3:00 Lots of Russian olive trees and we were starting to see some sagebrush. 3:04 Reduced speed as we approach Gering. 3:05 Entering Gering, 48°, and passing the motel where I have stayed. 3:11 Crossing the North Platte River. 3:12 Pulling into gas station ... Jo, “... likely to be more expensive further along!”. We continued north along NE-71. 3:43 There was a field of bison just as we were coming into Mitchell ... 46°. 3:48 Ostrich and/or emus in with cows in a field to the right. 3:58 Half dozen foals prancing around in a field with horses. 428.3 4:00 Nebraska/Wyoming State Line. NOTE: Wyoming National Guard used the bucking horse insignia and rider (BH & R) on their uniforms during WW 1. Later the governor of Wyoming claimed to have designed the bucking horse on the state’s licence plate. He claimed something which wasn’t his. Sam had an uncle who knew who had designed. 4:03 A huge feed lot to the right ... also sandhills continue to the north of the road ... it has been raining since leaving Scott’s Bluff. 4:19 Entering Lingle, pop. 510, El. 4,165 feet ... nice mural on wall. 4:21 Young corn crop outside of town. 4:29 Fort Laramie, pop. 243, El. 4,230 feet ... it is still raining. 4:35 Herd of horses to the north ... a change in topography - countryside much hillier and the road winding around much more. 4:39 Five trains lined up side by side. 4:41 Marshaling yards - coal trains galore. 4:43 Guernsey, pop. 1,147, El. 4,354 feet ... ruts and Register Cliff. 4:45 Crossing the North Platte River ... road going into rugged rocky hills and seeing lots of sagebrush. 4:50 Rocky outcrops on top of hill to the left ... not much to see, just lots of green grass and a few cattle grazing. 4:57 A lot of chicken sheds out to the left. 497.4 4:59 Junction with I-25. 5:01 A sign for Thermopolis, Wyoming Dinosaur Center and Hot Springs State Park. A car which had sped past us hydroplaned off the road ahead of us. He went off the road to the right, up the embankment, turned and back down again. It was truly surprising that he did not roll! Jo was driving at the time - can’t remember when she and Sam changed. It is raining steadily and visibility is not so good. Besides it is getting darker. 5:12 Pine trees on the hillsides. 5:15 Metal cutout of cowboy and bucking horse on hill overlooking road. 5:17 Big lake to the right - Glendo Reservoir, which goes back behind the hills. 5:20 The Glendo Dam on the North Platte River is just below the road ... huge cutting along the road on the left. The fence is made of hog wire - 6 inches x 6 inchea squares and this prevents pronghorns coming onto the road. 5:23 A lone pronghorn buck. 5:24 North Platte River can be seen to the right ... it is still raining, but not quite as heavy. 5:29 Crossing the North Platte. 5:32 Missile silo to the left. 5:38 Leaving I-25 at Exit-135. 527.7 5:40 Alpine Inn, Douglas, WY ... $45.36 on M/C (Self) ... five pronghorns could be seen from the bathroom window. After taking our bags in we went for supper at the Village Inn (M/C $9.75). 528.7 7:35 44° ... leaving Village Inn to drive through Douglas to look at the town ... stopped at Fetterman Historical Marker ... saw three more pronghorns. 538.5 Back at the motel and end of the day. 538.5 7:35 Leaving from Alpine Inn ... there are pronghorns behind the motel as we leave ... 43° - at least the sun is shining! 7:45 Crossing the North Platte River. 7:47 - 7:50 Stopped at the Historical Marker for Fort Fetterman ... the sky was blue. 7:52 Pony Express rider on top of a hill to the right. 7:53 Jackalope on top of a hill also ... more pronghorns than can be counted! 7:54 More pronghorns scattered over the landscape. 7:59 Roadwork ... two-way traffic. 8:03 Pronghorn by the fence to the left, and more to the right. 8:08 More to the left and to the right. 8:10 End of roadwork and back in our own lanes again. 8:11 A lot of pronghorns up to the left. 8:12 A dinosaur cutout on the hill to the right. 8:14 Pronghorn to the right ... working oil pump to the left ... then pumps left and right (because of the number of oil pumps we were seeing Sam mentioned the Teapot Dome Oil Field - I have been on line and there are a number of articles regarding Teapot Dome and Salt Creek - a map of tour sites included an area along Poison Spider Road out from Casper) ... pronghorns all along the way. 8:30 As we approach Casper, there is an oil refinery to the right. 8:32 Leaving the highway to get breakfast. 598.7 8:35 - 9:04 McDonald’s for breakfast ... there was an eagle soaring overhead as we left. 9:06 Back on the highway ... patches of snow on the mountains to the left ... the sun is still shining but clouds are building up. 9:16 Rock formations protruding on the left ... pronghorns continue all along the way. 9:23 A long Wyoming snow fence to the left. 9:25 Sam said, “In areas like this where there was little traffic, the Interstate used to be only two lanes, a divided road with one lane each way. Then the law stated that all interstate highways had to be two lanes each way.”. 9:32 Erosion along the river (North Platte) - badlands developing. 9:35 Deer fencing both sides of the road keep both deer and pronghorns off the road. 9:43 Prairie dog town and a baby pronghorn feeding ... roadwork and two-way traffic. 9:47 Pronghorns and black cattle to the left. 9:52 A dead skunk, which means they are out there somewhere! 9:54 Herefords and pronghorns to the left ... a group with babies to the right. Quite simply there are pronghorns all over the place. 9:58 A cowboy on horseback ... cattle ... a mother pronghorn and twin babies. 10:00 Black cattle to the right ... some pretty yellow wildflowers, but I can’t identify them as we drive by. 10:01 Crossing the South Fork Powder River ... prickly pear cacti on the embankment. 10:03 Sheep on the hillside. 10:04 More sheep and pronghorns. 10:08 Crossing Middle Fork Powder River ... lots of horses. 10:10 Starting to see a few small yucca. 10:12 Crossing North Fork Powder River ... starting to see Bighorn Mountain Range. 10:17 Blue wildflowers - going too fast to identify! 10:25 Flax blooming ... pronghorns continue. 10:27 Lots of flax in flower in the median. 10:29 Crossing Crazy Woman Creek. 10:30 Middle Fork Crazy Woman Creek ... not seeing as many pronghorns now. 10:35 Cattle grazing on left ... shorn sheep (big ones) on right ... then more pronghorns. 10:43 Irrigation pipes in operation. 10:44 Buffalo next 3 exits. 10:45 Big group of pronghorns to the right ... cattle ... trees ... Exit-298 ... more homes. 10:46 Starting to see some red rock. 10:48 Some elk to the left, their antlers starting to grow. 705.1 10:48 Junction with I-90. 10:50 Huge herd of pronghorns to the left ... roadwork - right lane closed briefly. 10:53 Lake De Smet, a natural lake. 10:56 Dark clouds above and it is raining ... lots of pronghorns ... driving through the foothills of the Bighorns ... cloud hiding the mountains. 10:59 Fort Phil Kearny (Historical Marker in Douglas) ... red rock exposed ... Story exit. 11:01 Masses of yellow flowers ... deer. 11:04 Pulling into a Scenic Turnout - pictures. 11:10 Back on the highway. 11:11 Someone has some llamas (to the left) - I wonder if they also have sheep! 11:20 A patch of purple flowers on the shoulder - looks like Dames Rocket. 11:25 Leaving the highway at Exit 20 to return to the Visitor Center. 11:28 Back on the highway (going SE). 11:30 Leaving the highway at the next exit, Exit-23, for the Welcome Center. 743.8 11:32 - 11:53 Rest Area and Welcome Center. 11:55 Back on I-90 ... after third exit the road closed for roadwork - road being torn up - major construction on road and bridges ... two-way traffic in the southbound lanes. 12:04 End of construction (near MP-15) ... flax in flower. 12:10 Two pronghorns ... we had just commented that we hadn’t seen any for a while! 12:11 We are opposite the road going up the mountain side, US-14, which goes over the Bighorns ... pronghorn. 12:13 Very fertile valley to the left - cultivated. 768.8 12:18 Wyoming/Montana State Line ... MP-553 in Montana which means that the Montana/Idaho State Line is 553 miles via I-90. 12:18 Red-tail hawk to the right. 12:25 Lots of cattle grazing on the hillside to the right. 12:29 One pronghorn to the right ... yellow flowers. 12:30 Hay bales on the hillside to the right ... horses and foals. 12:33 Lots of horses and foals to the right. 12:37 Exit-530 for Lodge Grass - a gorgeous view to the west - Big Sky country. 12:38 Going into hills with pine trees on the slopes. 12:40 A lot of yellow flowers - Balsamroot. 12:41 Cattle all through the hills and in among the trees. 12:45 Away from the trees and the hills are bare again. 805.6 12:49 Crossing Little Bighorn River. 12:51 Leaving the highway at Exit-514. 12:53 - 12:58 Garryowen - Custer Battlefield Museum ... pictures. From here we followed a side road to the next exit adjacent I-90 ... saw lots of horses. 1:05 Turning off US-212 into Little Bighorn Battlefield National Monument. 1:06 Pronghorn ... We parked the car, went into the Visitor Center, had lunch by the car (no picnic tables - Jo made sandwiches in the car). 2:08 Leave for a drive through the Monument. 2:39 Leaving from the end of the road - last picture of Wolf Mountains. 2:44 Leaving Sharpshooter Ridge ... picture over the river. 2:46 Leaving the next marker. 2:55 Leaving Deep Coulee interpretive sign. 3:00 Leaving Lame White Man Charge ... headstones. 3:06 Jo and I got out of the car and Sam went ahead to park. I took numerous pictures as we walked back, also some at National Cemetery. 3:33 We were back in the car and ready to leave. 826.0 3:36 Back on the highway, I-90. 3:51 Pronghorns to the right. 3:54 Getting up into farming country - strip farming ... farming in the valley whilst the hills are covered with sagebrush. 4:05 Two pronghorns running to the left. 4:07 Two more to the left. 4:08 Prairie dog town to the right ... countryside is hilly again and there is no farming. 4:12 More farming again, but in patches. 4:13 16 miles to Billings. 4:15 A few trees on top of the ridge to the right ... more trees to the left. 4:21 Can see Billings or suburbs in the distance. 4:22 Dropping down into the valley of the Yellowstone River. 4:23 Passing Exit-456 which is for I-94 East. 4:24 I-94 West ends at the junction with I-90. 4:27 Leaving I-90 in Billings at Exit-452. 4:29 Crossing the Yellowstone River ... The Rims (Rimrock - Plateau). 4:37 Downtown ... 73° ... hanging baskets - petunias. 4:50 Back at MT-3 after having gone round the block (one-way streets) ... 75°. We went up past the medical building where I had to take Anne in 1972, and continued on up the escarpment. 4:53 At the top where the Billings International Airport is located, and what a view looking back down over the city! 4:58 Prairie dog town on the right. 5:01 Pronghorn ... Strip farming. 5:03 Equestrian Center to the left. 5:10 Pronghorns ... two more ... three more. 5:11 Three by the road - a mother and two babies. 5:15 Pronghorn ... two more ... pronghorn fence. 5:17 Mother and baby ... more ... Jo and I are just looking to the right! 5:20 Ranch - black cattle ... pronghorns. 5:21 Entering Broadview, pop. 150 ... lilacs in bloom ... we are in Big Sky Country and it is raining out to the west. 5:30 A change in topography again ... rugged, rocky, some trees, coulees and ravines. 5:33 A collection of beehives. 5:34 Crossing the Musselshell River and immediately entering Lavina. pop. 209. 932.3 5:35 Junction with and turning west on US-12. 5:37 Lots of irrigating being done in this area ... saw two birds which looked like emus. 5:40 Big high cliffs to the right, rugged and eroding ... valley to the left. 5:41 White crosses at the side of the road. 5:44 There are nasty storm clouds to the south of us now ... the road we are on is following along the Musselshell River. 5:47 Dark rain clouds are gathering ahead to the right. 5:50 Entering Ryegate, pop. 268. 948.2 5:51 Chief Joseph Historical Marker - one picture. 5:59 Irrigation pipes and alfalfa. 6:02 Lots of goats - a big herd of them, also some babies. 6:07 Four deer ... a lone pronghorn ... more deer. 6:08 A large herd of Black Angus cattle. 6:09 More and more cattle ... a lush green valley ... big hay stacks. 6:10 A hawk hovering above the ground by the road. 6:11 Cattle left and right ... The vehicles used for transporting livestock are called possum belly trucks. 6:13 We are being rained on. 6:16 Pronghorn by a stream to the left. 977.7 6:18 Before entering Harlowton (bigger town with population of 1,062) we turned off US-12 onto US-191. Immediately after the corner there was a chain-up area. 6:21 A big farm operation to the right ... hundreds of acres of strip farming. 6:24 Five pronghorns to the left. 6:30 Big Snowy Mountains - mountain range to the right, which has some snow on it. 6:33 A dead skunk ... there is some wildlife around even if we can’t see it! 6:34 Entering Judith Gap, pop. 164. 6:40 Cattle to the left ... wonderful ranching country. 6:41 More sheep and lambs ... more cattle ... dust from farmer tilling his land ... some lovely farm properties. 6:43 Deer to the left. 6:46 A large flock of sheep to the left ... cattle to the right. 6:49 Entering Judith Basin County. 6:50 Extensive farming ... also irrigation systems. 6:51 Back in Fergus County. 6:52 Numerous sprinkler systems in operation to the left ... brown cows. 1,016.4 6:54 Turning left at the junction with US-87, which is also MT-200. 6:55 Judith Basin County again. 6:58 Huge stacks of large hay rolls to the left. 7:00 Crossing Judith River ... group of deer to the right. 7:04 Heartland Seed Company ... grain country both sides. 7:10 Sign: Little Belt Mountains ... these are to the south and there is snow on them ... we are into hilly country for a bit ... cattle. 7:18 I’m feeling quite tired, mostly because my right knee is in great pain. 7:20 Lots of cattle as we are coming into Stanford. 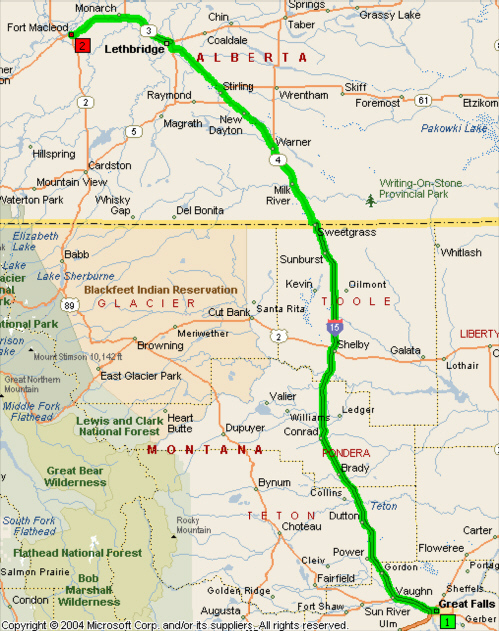 7:22 Flat butte of Montana to the north ... MT-80 goes north from US-87 to town called Square Butte, then on to Fort Benton, an historic town on the Missouri River. 7:24 Pronghorns on the skyline to the right. 7:30 The sky is looking very angry over the mountains to the south. 1,056.4 7:31 - 7:40 Montana Historical Marker - “MINING PLAYS SECOND FIDDLE” ... the tops of the mountains to the south were covered in dark storm clouds ... it was good to take a break and stretch our legs. 7:45 Sheep and baby lambs. 7:48 Black Angus cattle ... a lot of Black-eyed Susan or similar flowers. 7:50 The road is dropping down into a coulee. 7:53 Entering Raynesford ... the sun is still quite high but hidden by cloud. 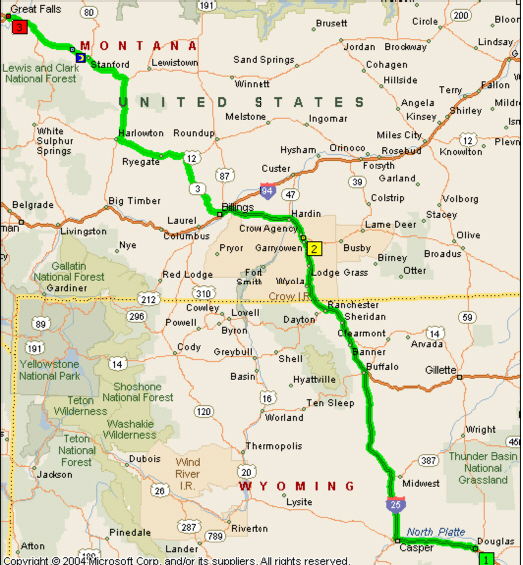 8:02 End of the coulee by the Rest Area near Belt ... US-87 is also joined by US-89 Great Falls 24 miles. 8:04 As the road climbed out of the coulee I could look down on the town of Belt below ... the road rises through a cutting before reaching the plateau again. 8:13 The sun is still high in the sky. 8:20 Entering Great Falls, pop. 56,690 ... went straight in on US-87 (MT-200). 8:29 Crossing the Missouri River. 8:33 Junction with I-15 North. 8:34 Crossing the Sun River. 8:35 Leaving I-15 at Exit-280. 1,109.2 8:40 Days Inn - $69.30 + tax = $74.15 M/C(Self) ... we went out for supper, drove around looking for a restaurant and finished up eating at Arby’s (M/C-$6.20). 1,117.6 End of the day. 1,117.6 8:34 Leaving Days Inn, Great Falls ... after discovering our first disaster - Jo had connected the electric cooler backwards and hence the contents had been heating overnight!! We had to throw out a lot of stuff but did manage to salvage a number of things which would not have posed a health risk. Continental breakfast at the motel. 8:51 Junction with I-15 North ... it is a dull and dreary day ... gray clouds and it is raining ... this is truly Big Sky Country with distant horizons all around and strip farming creates a patchwork of colors. 9:14 Crossing over to the southbound lanes and two-way traffic. 9:16 Three individual buttes to the north, one rounded on top, one going up to a point and one flat on top. 9:26 End of construction and crossing back to our own lanes. 9:33 A deer by the fence to the left. 9:34 Oil pumps continue for some distance - they are in the middle of farmer’s fields. 9:41 Road curving north at Conrad and the sky ahead looks a little brighter ... also going towards the individual hills or buttes. 9:45 A flock of sheep, all with black faces. 9:47 Sprinklers working to the left. 9:49 Roadwork - left lane closed. 9:51 A pretty view to the left - farms surrounded by trees ... farm buildings and the multi-colored fields. 9:58 Crossing the Marias River, then up the other side ... peaks appearing to be Sweet Grass Hills. 10:03 At the top of a hill and descending ... crossing a series of railway tracks at the bottom of the descent and passing Shelby ... then up the other side. 10:05 Oil drilling equipment and pumps ... away from crop fields ... hilly and more like ranching ... countryside is a lot browner and much dryer looking. 10:11 Pronghorn to the right. 10:14 Some ploughed fields again ... Sweet Grass Hills seem to be in two different ranges, so may have two different names. 10:18 More pumps ... a chipmunk ran across the road ... the sun is trying to burst through the clouds. 10:19 The countryside is dotted with pumps and holding tanks. 10:23 Sweet Grass Hills to the right now and tilled fields left and right. 10:25 Dry ponds or lakes which are white like salt pans. 10:27 Blue flowers along the shoulders and in the median. 10:29 Passing a triple trailer, the first one I think I’ve seen so far this trip. 10:33 The Interstate ends in Sweet Grass (no population given). The lowest population cited for towns or cities in Montana in the AAA 2005 Atlas is 37 for the town of Reserve, which can be found in northeast corner of the Ft. Peck Indian Reservation in the northeast corner of Montana. 1,235.4 10:35 - 10:47 Rest Area ... one picture in the Rest Area about the salt flats in North Montana. 10:50 Stopped at the Canadian border. 1,236.4 10:59 Through Customs and in Alberta, Canada ... Coutts, pop. 364. 11:00 A feeling of elation - we are on our way, a great adventure in front of us! 11:01 A big herd of elk in a pen ... extensive farmed fields. 11:04 It is raining - we are sick of the rain! ... hills or rolling country, not farmed, is grassy with some stunted sagebrush. 11:07 Salt pans both sides of the road. 11:08 Two little foxes to the right. 11:11 Leaving the highway for a Visitor Center. 1,248.4 11:12 - 11:33 Alberta Visitor Center. 11:36 Lethbridge 84 km (52.2 miles). 11:48 Raining again! ... cattle ... mixed grain farming ... ranching and sagebrush. 11:52 Lake to the right with a farmhouse at the water’s edge ... lots of cattle as well as tilled fields. 11:56 Passing through a somewhat rocky area, also salt pans. 11:58 Slough with bull rushes (cat tails). 12:00 Lots of cattle ... alfalfa being irrigated. 12:01 Sunshine Seed Cleaning Plant. 12:03 Bit more rain again ... What a way to start out on our adventure! 12:07 Lake to the left and ducks flying overhead. 12:14 A sign for Triticale Seed ... from the American Heritage dictionary - triticale: “A hardy hybrid of wheat and rye having a high yield.” On one of my previous visits with Jo and Sam we had looked at the ingredients for a pancake mix which she had and found triticale to be one of them. Not knowing what this was we proceeded to look at dictionaries and encyclopedias until finding the answer. After this I had not given it another thought until seeing this sign in Alberta. 12:16 Crossing a canal from St. Mary’s Dam - another name which brings back memories from my days in Alberta. 12:18 On the outskirts of Lethbridge ... still passing farms ...population is becoming more dense. 12:19 Reduced speed from 110 to 80 kph (68.4 to 49.7 mph). 12:21 Lethbridge, pop. 67,374. Wow! Has the place ever grown! It is not the sleepy little town I used to know! Irises in flower ... a Bell blimp in the air. 12:30 - 12:39 WalMart our first stop because Sam wanted to have the battery checked as it had been losing amps when trying to charge the batteries from Jo’s camera. He had an alternator problem and had to get a boost to start the car and drive to the Chevrolet dealership. 1,302.8 12:44 - 3:45 Chevrolet dealership. We were given a ride, first to Canada Trust for me to use the ATM for some Canadian cash, then to the Park Place Mall where we were able to have lunch at Smitty’s (Cash Can.$12.00). 3:47 - 3:53 Chinook Country Visitor Center (opposite the Chevrolet Dealer) ... raining again - there had been quite a downpour whilst we were at Smitty’s having lunch. After leaving the Visitor Center we drove around for a bit trying to get a good view of the railway trestle bridge, but couldn’t get anywhere near it like you could in the old days! "The trestle bridge at Lethbridge was completed by the Canadian Pacific Railway in 1909. Spanning 1.6 kilometers across the steep banks of the Oldman River at a maximum height of 314 feet, it is the longest and highest bridge of its kind in North America. The bridge is symbolic of the engineering challenges the railway faced in its bid to provide the Canadian West with a rail service." For more information about the bridge refer to the end of the day. 4:19 On Whoop Up Drive at the bottom of the Oldman River Valley. 4:22 Driving along University Avenue on the west side of the valley we crossed the train tracks. 4:24 Junction with Highway 3 West to Fort Macleod. 4:35 In the bottom of a valley which is tilled and being irrigated ... crossing Oldman River, then climbing out of the valley and back on the plateau ... sprinklers are working even though it is raining ... it seems to be a lot greener here than in northern Montana ... lovely looking farms. 4:47 Cattle and horses to the right. 4:50 Entering Fort Macleod, pop. 2,990. 4:51 Main Street ... drove through the town then back. 4:57 Crossing Oldman River - we are on the highway which goes to Claresholm and High River. 5:00 Turned around along the road to Head Smashed In Buffalo Jump ... it is pouring so, giving up on the idea of camping, we are returning to Fort Macleod to find a motel. 5:05 Windmill to the right - huge long arms. 5:06 Back in Fort Macleod. 5:07 On a one-way street going through town. 5:20 Kozy/DJ Motel - Can.$76.00 (Jo) ... took the computers in so was able to download pictures and write them to disc after we had been for supper. We walked to Aunt Lynda’s Café and had a bowl of soup (we had a big lunch so weren’t very hungry.) - Can.$3.61 cash (Self). Whilst we were out we also went to the supermarket to pick up a few supplies for meals along the way. 1,353.0 End of the day. The landmark Canadian Pacific Railway bridge near Lethbridge is one of the largest railway structures in Canada. It was built in 1907-1909 as part of a major diversion of the Crowsnest Pass route between Lethbridge and Fort Macleod. It has been called either the Lethbridge Viaduct or the High Level Bridge at Lethbridge. Originally, the Crowsnest railway mainline tracks actually bypassed Lethbridge which was reached by a one and a half mile (2.4 km) spur. The tracks swung south from Lethbridge, passed through Whoop-up and crossed the St. Mary's River on a long wooden trestle. Measuring 2,933 feet (894 m) long and 65 feet (20 m) high, the bridge was an impressive sight but steep grades were required to reach it. Extensive cuts and many other bridges were needed to cross creeks and coulees (the wide steep-walled river valleys of the western Prairie rivers and streams). For example, after crossing the St Mary's River was passed several large cuts were required. One needed the excavation of 120,000 cubic yards (91 750 cubic metres) of materials. Some of the substantial bridges were a 900-foot (275-m) trestle with a 200-foot (61-m) span west of the St. Mary's River, a 600-foot (183-m) trestle at Eight-Mile Coulee and nearby another of 900 feet (274-m) in length and at Sixteen-Mile Coulee there was an 800-foot (244-m) trestle, 133 feet (40.5-m) high with a 200-foot (61-m) truss span over the creek. Overall, the trestles on the original line out of Lethbridge totalled 2.8 miles (4.5 km). Although the 37-mile (59.5-km) route accomplished its purpose in permitting the rapid completion of the railway, it proved to be an expensive section of railway to operate and one that was soon in need of replacement. The original bridges built during the construction of the Crowsnest Route were designed to last only about 10 years and the CPR decided, after extensive surveys and engineering studies in 1904 and 1905, to construct a completely new route on a better gradient to bypass the original line. The new line was built to the north of the Old Man River and required two large bridges, one just west of Lethbridge - the famous High Level Bridge - over the Belly River and another over the Old Man River west of Monarch. It eliminated many curves and reduced the grade from 1.2 percent to only 0.4 percent and saved 5.26 miles (8.5 km) of track. After engineering studies and planning, preliminary work began on construction in the summer of 1907. The first pile for the bridge was driven on October 26, 1907. Clearing, grading the site, the construction of piers and footings progressed while the steel work was being prefabricated. Once the steel work reached track level at the Lethbridge end, it was possible to begin using a huge travelling crane called an "erection traveller" which was used to lower the steel beams and girders into place. Raising the steel work began in mid-August 1908, the last girder was placed on June 20, 1909 and the riveting was completed on August 9, 1909. It took 645 railway cars to transport the steel to the bridge site and another 40 to bring in construction equipment. Overall, about 900 carloads of materials were needed for the project. The massive structure over the Belly River is 5,327.625 feet (1 623.86 m) long and rose 314 feet (95.7 m) above the river bed. Over 12,400 tons of steel were used in its construction and the original cost was $1,334,525. The design incorporated 44 plate girder spans each 67 feet, 1 inch (20.4 m) in length and 22 plate girder spans each 98 feet, 10 inches (30.15 m) long. In addition, there was one riveted lattice-truss deck span 107 feet (32.6 m) long near the west end of the bridge. These spans were supported by a total of 33 rigidly braced steel towers. The second bridge on the new route, the Old Man River crossing, is 1,890 feet (576 m) long and 150 feet (45.7 m) high. The Lethbridge Viaduct was designed by the CPR's bridge department in Montreal and the field work was directed by J. E. Schwitzer, Assistant Chief Engineer, CPR Western Lines. The steel work was manufactured by the Canadian Bridge Company of Walkerville, Ontario. C.F. Prettie was in charge of the bridge company's operations at the site and had a gang of about 100 men working under him. The bridge proved to be an enduring engineering work. Initially there were some problems with settlement of the underlying sediments around some of the footings but these were rectified. The big bridge is still in use. 8:43 Joined the highway - can see the hills which we couldn’t see last night. 8:45 Turned around to go back for gas. 8:55 Passing the one windmill which I noticed last night and now I can see a large wind farm beyond that. 8:57 Hawk sitting on a fence post. 9:01 Turned around because we were on the wrong road. 9:07 Back at the junction for Highway 2 to Calgary. We had missed the turn inadvertently and headed out on Highway 3 to Pincher Creek. 9:09 Turned off for Head Smashed in Buffalo Jump ... cattle and young calves. 9:19 Tepees - about seven to the left ... then the entrance to the right. 1,380.8 9:23 - 11:48 Visitor Center at HEAD SMASHED IN BUFFALO JUMP ... the center is built into the side of the hill and blends in with the landscape. 11:50 - 11:55 Stopped in overflow parking lot for pictures towards the cliff ... the trail to the bottom of the cliff was closed because a mother cougar was there with a cub. 12:01 Leaving after a picture of Split Rock. 12:09 - 12:12 Back by the highway ... pictures of sign “Buffalo Junction. 1,391.6 12:12 Turning north on divided Highway 2 ... Calgary 160 km (100 miles). 12:31 Entering Claresholm, pop. 3,622 - El. 3,394 feet. 12:34 North of town ... big agricultural area. 12:42 Stavely, pop. 442 - the road bypasses the town. 12:44 Oil pump to the left. 12:45 A hawk to the left is flying around. 12:46 Lots of cattle both sides of the road ... just beautiful countryside. 12:50 Land becoming a little more rolling, but still with vast vistas. 12:58 High River now 31 km - 20 miles. 1:04 A sign for a Hutterite Colony 10 km to the west. 1:05 Happy Face Equestrian has a big barn with a big happy face on the side of it - two windows for eyes at the top with a third window in the center below them for a nose and a huge V painted on for a mouth. 1:13 High River, pop. 9,345 ... leaving Highway 2 for AB-23. 1:16 - 1:23 McDonald’s - rest and pit stop (no purchase). 1:24 Back on the road going west. 1:29 Crossing Little Bow River. 1:31 Leaving High River behind. 1:32 Turning west on AB-543 ... also starting into the foothills. 1:36 Starting to see the mountains. 1:37 Birdhouses, various colors, one on each fence post around a house to the left ... countryside lovely and green ... beautiful farm properties. 1:45 One ranch after another. 1:51 Oil pumps everywhere ... turned around to go through Turner Valley instead of the Kananaskis Highway. The weather did not look good in the mountains and it was getting late in the day. I was sad that we had to forgo this section of our planned route because I always loved that highway so much! 1:55 Back where we had turned onto AB-22 when we left AB-523 from High River and continuing north on AB-22. 1:59 Elk - ranch raised elk meat. 2:00 Black Diamond, pop. 1,866 ... a pretty town ... lilacs in bloom. 2:02 Turning left at the Stop sign, but remaining on AB-22. 2:03 Crossing Sheep River ... bicycle path to the right. 2:05 Turner Valley, incorporated 1930, pop. 1,608. 2:07 - 2:16 Rhyolite Millennium Park ... after leaving the park we continued north on AB-22. 2:23 Huge new houses being built up the hill to the right. 2:25 Huge homes to the left and into the wooded foothills ... the road is actually in the valley ... going north on west side of the valley ... ranching. 2:28 Prairie dog town to the left. 2:32 Lots of tilled fields to the right ... also lots of cattle to be seen ... a strong wind is blowing. 2:35 Stop sign - turn left 0nto AB-22X to Bragg Creek - a divided highway coming out from Calgary (only about 25 miles west of Calgary). 2:36 Two-way traffic ... WOW - stone house to the left, horse farm to the right. 2:41 Golf course ... horse farm ... big houses ... top of crest before the road drops down - a fabulous view of the mountains in the background ... the hills are becoming higher. 2:46 The road is hemmed in by trees on both sides. 2:47 Top of a steep hill. 2:48 Turning north again - Cowboy Trail. 2:49 It is raining ... we just can’t seem to get away from it! 2:50 Half a dozen donkeys ... entering Bragg Creek, pop. 678. 2:51 Hwy. 1 18 km ... evergreens both sides of the road. 2:52 Two deer ... the rain didn’t last for long. 2:53 Golf course to the left. 2:57 Out from the trees ... flat land ... horses. 2:58 Crossing the Elbow River. 3:03 Junction with the Trans Canada at interchange 161 ... and we are heading towards the mountains. Yippee! 3:14 Some lovely small lakes to the right of the road. 3:16 Scott Hill Summit, El. 4,624 feet ... we are well and truly back into the foothills and we have a long drop down from the summit into a valley. 3:20 Down and crossing the valley ... black and white clouds, also blue sky. 3:23 Black rain clouds are completely blanketing the mountains ... it looks absolutely miserable. Yuck!! 3:25 And now it is starting to rain on us. 3:28 Passing Exit-118 for Highway 40, the Kananaskis Highway, where we would have joined this highway had we gone that way ... a steady rain is continuing. 3:30 The mountains are rising up like a wall in front of us. 3:31 Crossing the Kananaskis River ... heaviest rain appears to be to the north. 3:34 In the mountains ... mining to the right. 3:37 The rain has almost stopped. 3:38 A group of uni-cyclists on the opposite side of the road. 3:39 Incessant rain started again ... there is snow in the ravines at the upper elevations. 3:45 Crossing the Bow River. 3:47 Canmore, est. 1883, pop. 10,792 ... rain more or less stopped again and there is some blue sky! 3:49 Leaving the Trans Canada for the Canmore Information Center ... sun is shining on the mountain ahead. 3:52 - 4:03 Visitor Center. 4:05 Back on the highway. 4:10 Entrance Banff National Park ... 24-hour fee $12.00. 4:13 There has been a forest fire on the right side ... raining again! 4:16 Interesting soil erosion to the right ... lots of crevices. 4:19 Leaving the highway at the first exit to find Tunnel Mountain Campground and guess what? It’s raining again! Drat the rain! ... waterfall coming all the way down the mountain side. 4:27 Entrance to Campground - site $22.00. 1,593.2 4:31 Arrive at our designated campsite # D5 ... drizzling but we manage to get the tent up ahead of heavier rain. 5:00 - 5:15 Sat in the car. 6:15 Leave camp for drive into town ... a deer (buck) grazing in the camp at the side of the road ... another deer at the side of the road. 6:34 Main Street and crossing the Bow River ... Banff Springs Hotel 1888. 6:40 - 7:00 Walk by Bow Falls ... then drove up Sulphur Mountain. 7:20 Going back down the mountain ... elk. 7:30 - 8:22 Parked behind Main Street ... walked along Main Street to McDonald’s where we had some supper - Can. $6.62 (Self). 8:44 Deer ... cloud in the valley. 1,612.1 8:48 Back at camp ... end of the day. 1,612.1 9:15 All packed up and on our way ... had cereal and toast for breakfast. 9:19 On Tunnel Road which runs into Otter street. Leaving the gas station I noticed the large tree by the Catholic church was loaded with pink blossom. 8:45 Joined the Trans Canada Highway. 9:48 Leaving the Trans Canada. 9:55 We joined the stopped cars to take pictures of the elk grazing nearby. 10:17 - 10:22 Moose Meadows ... 9,075 feet Mt. Eisenhower, formerly known as Castle Mountain. 10:27 A pull off for Mt. Eisenhower. 10:33 - 10:38 Memorial for WW I Austro-Hungarian-Ukranian Internment Camp. 11:02 A T-junction and we turn left to go into Lake Louise. 11:05 - 11:26 Lake Louise Visitor Center - wonderful information place and museum. 11:29 Hanging glacier, Temple Mountain. 11:31 A rushing stream to the right, then the first view of Chateau Lake Louise. 11:34 - 12:29 Lake Louise - walked along the lakeside trail and went into the Chateau. 12:32 Turned off for Moraine Lake. 12:35 Some snow lying on the ground. 12:48 - 1:08 Moraine Lake ... big disappointment - lake was very low, the water flowing under the moraine during the winter ... it refills when glaciers melt towards end of June. I guess back in the 50's I never went to Moraine lake so early in the season! 1:16 Leaving after picture of a small avalanche. 1:26 Picture of Paradise Creek from the bridge. 1:28 Back at the road into Lake Louise. 1:29 Pulling into a picnic ground. 1:30 - 2:02 Lunch - sandwiches. 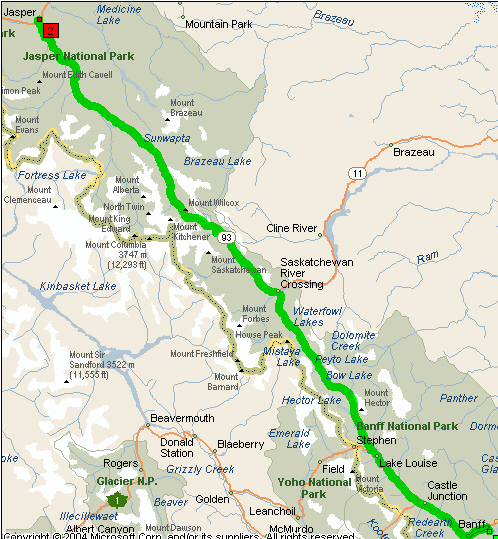 2:07 Junction with Trans Canada and AB-93, the Icefields Parkway - road to Jasper. 2:10 - 2:11 Stopped at entrance ... our park pass was good until 4 o’clock! 2:32 Stopped for roadwork ... passing landslide, hence roadwork. 2:36 Hanging Glaciers to the left - Crowfoot Glacier. 2:39 Bow Lake (mile 21 along the parkway) - glacier from Wapta Icefield. 2:43 Mile 25 - Bow Pass and turning into Peyto Lake. 2:44 Parked, snow surrounding the parking lot, but we changed our minds right away because we did not know how far we had to walk to the lake! 2:46 Back on the Icefields Parkway. 2:50 A glacier, to the left , like a long tongue coming down the mountainside. 2:56 - 2:58 Two hanging glaciers, lichen and rock (just before Waterfowl Lakes). 3:12 Crossing the North Saskatchewan River. 3:13 Passing the turn off for AB-11 to Red deer. 3:16 Mountain to the left, Mount Wilson, with individual fingers of rock sticking up, has steep vertical and rounded cliffs. 3:22 Blue sky can be seen ahead but it is raining here where we are. 3:32 Vertical rock cliffs - unbelievable cliffs and to the left a wide braided riverbed with a stream meandering from side to side. 3:34 Six side-by-side waterfalls to the right ... rushing stream ... sun shining and a glacier gleaming against a blue sky. 3:37 A flock of mountain sheep, but we could not stop ... I took pictures from the car as we climbed to Sunwapta Pass. 3:40 - 3:46 Stopped at a viewpoint ... could see the sheep below. 3:48 Nigel Creek to the right. 3:50 Top of the climb - Sunwapta Pass, El. 6,782 feet. 3:53 Raining more heavily ... entered Jasper National park. 3:57 Mile 79 - pulling off the highway for the Columbia icefield. 3:58 - 4:18 Columbia Icefield - stopped to take pictures of the Athabaska Glacier and went into the Icefield Interpretive Center. We continued north along a flat river valley - the Sunwapta River flowing towards its confluence with the Athabaska River, the headwaters of which are back behind the Columbia Icefield. 4:22 Mountain sheep - rams. 4:27 A sign - cariboo crossing road for the next 20 km (12.4 miles). 4:39 Lots of rubble to the right - could see where it fell from high up the mountain. 4:41 Crossing Poboktan Creek and the Endless Chain Ridge begins on the right. 4:49 Another shower of rain. 4:54 The sun is shining again ... I wonder if it is like this all the time! 5:01 Now we have the Athabaska River on our left. 5:05 We are driving in quite a broad valley. 5:08 Turning left on AB-93A, the only route there was when I was here in 1959! 5:09 - 5:34 Mile 124 - Athabaska Falls. 5:40 Mount Edith Cavell to the left. 5:52 Crossing the Athabaska river. 5:53 Prairie dogs to the right ... the first campground was closed. 5:57 Leaving highway at Whistler’s Mountain Road for Whistler Campground. 5:58 In line to register at the entrance(it was filling up quickly - Can.$22.00. 6:05 Driving to our camp site - # 5A. 6:08 After getting the camp set up Sam drove me to the telephone back near the entrance. From here I called Lorena and made arrangements to call her the next day from Grand Cache, hopefully to make arrangements that we would be able to see each other. I had not seen Lorena since August 1974! After supper we drove up Whistler’s Mountain Road to the Jasper Tramway. Though closed, we could walk around and look down on Jasper in the valley. We saw a rainbow as we drove back down to the campground. 9:10 Driving back into the campground, but took a spin around the campground before calling it quits for the night. 9:16 Our tour was rewarded with seeing at least six elk in the campground. 1,826.7 9:35 Back at camp and end of the day. 1,826.7 9:58 Leaving our campsite ... it took three hours for breakfast (cereal and toast), breaking camp and packing up - too long! But we have just too much stuff! 10:01 Checking out and a minute later we turned onto AB-93. 10.03 Crossing the Miette River. 10:04 The junction with the Trans Canada Highway 16 from Prince George, known as the Yellowknife Highway. 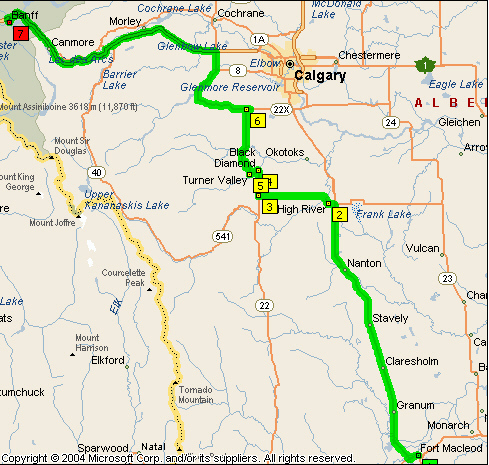 We will take this in the direction of Edmonton until the junction with AB-40 where we turn north. Opposite the gas station was a very nice stone building in which the Information Center was located. There was also another stone building with the title NATURE CALLS. Jasper is a very pretty little town, more so than Banff, I think! 10:18 Junction with Hwy-16 after driving through town ... the Athabaska River is to the right of the road. 10:20 Passed the turnoff to Maligne ... road follows the valley of the Athabaska river which is broad with numerous channels ... mountains have unbelievable sheer rock faces. 10:28 Sand dunes to the right. 10:30 The Palisades to the left ... the valley is very broad. 10:30 Crossing the Athabaska river. 10:31 The strata in the cliffs display vertical uplift. 10:35 The river is very wide here. 10:37 A long lake to the right. 10:43 The mountain to the left has an interesting swirl of rock layers. 1,834.4 10:48 Leaving after lots of pictures of the sheep. 10:51 Passing Pocahontas Cabins ... the sun is shining. 10:54 Cloud is covering the mountain tops, but the mountains are also not as high ... still rocky. 1,860.7 10:56 Leaving Jasper National Park ... 15 miles to Hinton ... and now we are more or less leaving the mountains and are in the foothills. The road is like a parkway, cut grass both sides beyond the shoulder then trees. 11:02 A deer ran across the road. 11:09 Passing the turnoff for AB-40, the road we will be taking, but Sam wanted to stop in Hinton before heading north. 11:11 Entering Hinton, pop. 9,405. 11:34 Back on Hwy-16 going west. 11:37 Turning north on AB-40, Scenic Route to Alaska ... Grande Cache 142 km, (88.2 miles) Grande Prairie 325 km (201.9 miles)... speed limit 100 kph (62.1 mph). 11:38 Looking down onto river ... thickly forested. 11:39 Crossing railroad and descending to the river. 11:40 Crossing the Athabaska River and immediately climbing out of the valley. 11:42 There has been a forest fire through this area at one time. 11:45 Driving through a Provincial Park, the William A. Switzer Provincial Park. 11:47 - 11:49 Group picking up trash in orange bags ... the woods or forest is a mixture of conifers and deciduous trees ... road going through a park-like setting - grassy areas as well as grass by the road ... woods and quiet little creeks. 11:55 Hay River Road goes off to the right. 11:57 Sand and gravel pit to the left ... woods mostly conifers, tall and slender - very thick ... the deciduous trees seem to increase when road is dropping down into a valley. 11:59 The view ahead above the trees is of mountains. 12:00 Another sand and gravel pit to the left. 12:00 Crossing Wild Hay River - water moving rapidly. 12:02 Railway just to our right before veering off. 12:03 Deer to the right. 12:04 The forest on the left has been cut down and there is a sign for logging trucks entering the road. 12:06 The train line is back by the road ... dark clouds seem to be gathering in the sky - not very promising weather ... rough road ... some blue sky ... all these trees, for the most part the only view, are far more boring than the open prairie or driving across Nebraska! 12:10 Some deer on the left. 12:11 An area which has been and is being logged ... still crossing creeks. 12:14 Crossing the train tracks. 12:16 Quite hilly with occasional glimpses of mountains to the left. 12:18 Crossing small rushing stream ... sign for surveyors at work ... sign telling when the forest was harvested, but we are passing too quickly to read the date. 12:19 - 12:20 Passing surveyors. 12:21 Fox Creek - big culvert under the road ... driving in some sunshine. 12:23 Pine trees rather than fir (or spruce ?) - fir tall and slim, whilst pine trees are more spread out. 12:25 Sign: Wild Game On Road Next 32 km (19.9 miles)... also sign for cariboo ... and another sign: Wildlife Sanctuary Next 40 km (24.9 miles). 12:26 Crossing the Berland River. 12:32 Welcome to Greenview District 16 ... a little bit of snow among the trees. 12:33 Stopped for a flag woman ... repairing surface ... woman working the big roller. 12:35 At the other end ... another flag woman ... big buildings along the skyline ahead?? But I don’t think we go anywhere near them so they remain a mystery!! 12:41 Burleigh Creek - white tail deer ... the forest just goes on and on. 12:44 Deer ran into the trees on the left. 12:45 A number of birdhouses along a fence - Muskeg River ... Grande Cache 27 km (16.8 miles). 12:49 Spitting rain and crossing a deep gully with a rushing stream. 12:50 More roadwork - putting in a culvert. 12:51 Drilling rig going in the opposite direction ... steep downgrade. 12:55 Foothills Forest Products Inc to the left - Weyhauser Canada. 12:58 - 1:00 Gravel road ... and it is raining! 1:03 Snowy mountains ahead ... numerous creeks. 1:05 Driving alongside Grande cache Lake. 1:07 Coal seams in roadside cutting. 1:09 WELCOME TO GRANDE CACHE and pulling off the highway to go into the Tourist Information. 1,964.1 1:10 - 1:39 Tourist Information ... pictures of Ranger station and of the forest. 1:39 Back on the highway which is east of the town center. 1:40 Turn off the highway to go into town. 1:42 - 1:53 Super Foods, Bakery and deli - $2.99 for three sausage rolls. 1:56 Deer to the right, then one to the left. 1:57 Sign: No Services Next 184 km (114.3 miles). 1:58 Elk to right in meadow below the road ... Crossing Smokey River - plank bridge ... road follows the valley of the river ... green on mountainside - dark and light greens, the light green being the deciduous trees. 2:04 The road is wet ... railway to the right, then the river which is racing along. 2:07 Forest covered mountains or hills and sheer rock faces. 2:08 Generating station on the river and a coal mine up the hill to the left, and it is raining again! 2:12 The river is spreading out in several channels. RAIN ... RAIN ... RAIN ... RAIN ... will it ever stop? 2:15 Crossing another river which flows into the Smokey. 2:19 The road has climbed and maybe is turning away from the river. 2:22 Sam saw falling rock on left high above the valley floor. 2:24 Crest of climb - magnificent views both ways of the valley below ... even the water in the ditch is rushing along. 2:35 Logs piled up on the left ready for pick up. 2:37 Some beautiful blue sky ahead, but for how long? 2:38 16th Base Line, which marks the North/South Hunting Boundary. 2:40 It seems to have stopped raining! 2:44 Crest of a high, long descent ... sign to use low gear. 2:45 There are woods as far as the eye can see. 2:49 A turnout looking over a valley and vast area before dropping behind a hill. A number of places with oil drilling equipment and holding tanks. 2:50 Near the top of another steep hill, then down again. 2:53 Crossing the Kakwa River which is flowing towards the Smokey, then climbing again. 2:56 Flames coming out of a chimney - oil or gas well. 2:57 Another drilling rig, this time to the left. 2:59 Raining again ... lightly ... briefly. 3:04 Big stacks of logs on the side of the road to the right. 3:06 Oil pump to the right and surveyors to the left. 3:10 A sign for 7% downgrade. 3:11 Starting down and can see the road going up the other side. 3:12 Crossing Cutbank River and up the other side ... in sunshine ... we are traveling at 60 mph approximately. Long straight road ahead, the dandelions making a great splash of color along the roadside. 3:18 The trees are changing and looking more like scrub. 3:20 Piles and piles of logs, cut, stacked and ready for hauling. 3:22 End of the straight stretch as we curve to the left. However, the power line continues straight ahead. 3:26 Gas or oil pipeline. 3:27 Lots of tall white birch. 3:28 Crossing Big Mountain Creek ... road going uphill ... like a parkway - very pretty with wide grassy area each side of the road before the tree line. 3:20 Crossing bald Mountain Creek ... up and down hill between creeks ... sun still shining. 3:31 Big herd of cows to the right ... I had just commented about there being a fence, then suddenly spotted the cows through a gap in the trees. 3:32 Another drilling rig and holding tanks. 3:35 A house to the right (log house) ... countryside much flatter ... not sure exactly when we left the hills! 3:39 Marshes ... cattails ... two deer. Oriented Strand Board (OSB) is an engineered, mat-formed panel product made of strands, flakes or wafers sliced from small diameter, round wood logs and bonded with an exterior-type binder under heat and pressure. The Ainsworth Plant, 10 miles south of Grande Prairie, is part of a huge lumber operation. 3:42 Sandhill to the right ... another sandhill. 3:43 Lake to the left. 3:45 Sand and gravel pits both sides, then downhill and adjacent to a river on the right. 3:47 Crossing Wapiti River bridge, then uphill ... another sandhill. 3:48 Six to eight Oil Service trucks in a convoy ... outskirts of Grande Prairie. 3:50 Entering Grande prairie, pop. 40,226. 3:56 Huge wood plant - Canadian Forest products - between 80th and 100th Avenues. 3:58 Acres of lumber ... then Oil Field Supply Co.
4:00 Turning off AB-40 onto AB-43 ... AB-43 is also 100th Ave.
4:01 Turning onto 116th Street, which is a gravel road. 4:07 A field to the left is covered in dandelions which have gone to seed. 4:10 Turning onto Country Road 722. 4:11 Turning into Country Roads RV Park. 2,086.6 4:12 - 4:21 Stopped to register. First of all we were told that there was no site available, an upsetting situation because this is where I had told Lorena she would find us. I was in the process of writing a message to leave for Lorena when the man said he would have someone check the tent sites because he thought that a group may have left! We could stay! The site cost $15,00 + GST $1.05 (Cash by Self). 4:25 Backed in near campsite - pools of water on roadway and where we parked ... the area was grassy and there was plenty of room to set up the tent, but everything was rather damp ... had just started to unload and set up camp when Laurie and Joe arrived, having driven down from Hines Creek. Jo and Sam sent me off with my friends whilst they put up the tent and prepared all the beds for the night. I went into town with Laurie and Joe, and drove around a bit whilst trying to catch up on lots of news. I had not seen Laurie and family since August 1974! 6:00 - 7:50 We met Jo and Sam at Kelsey’s for supper, my treat. (C$77.65 on M/C - US$64.00 + currency conversion fee $1.86). After supper Laurie and Joe left for the 85 mile drive back to Hines Creek and we returned to camp. 2,098.8 8:12 Back at camp. We had quite a hike from the campsite to the shower and toilet block, which was very nice and very clean. A notice at the door said that shoes must be removed before entering, so after traipsing through the mud to get there the dirt was not taken inside. The showers were coin operated and it cost $1.00 for 4 minutes! 2,099.4 End of the day - Sam took the car when he went for a shower. 2,099.4 8:24 Leaving after another wet night! It was gorgeous at 6:00 am when I had to take a “½ mile hike” to the bathroom. I did not have such a good night - it was still daylight at 10:00 PM and light at 11 o’clock! 8:32 Junction with AB-2 ... a very foggy morning. 8:40 Turning left on 100th Ave. - Sign: ALASKA. 8:46 - 9:36 Smitty’s for breakfast ... too wet at the campsite for making coffee and breakfast (Cash C$26.54 - Self) ... from here we hit the road and headed out of town. 9:39 Turned around to go back into town to buy gas. 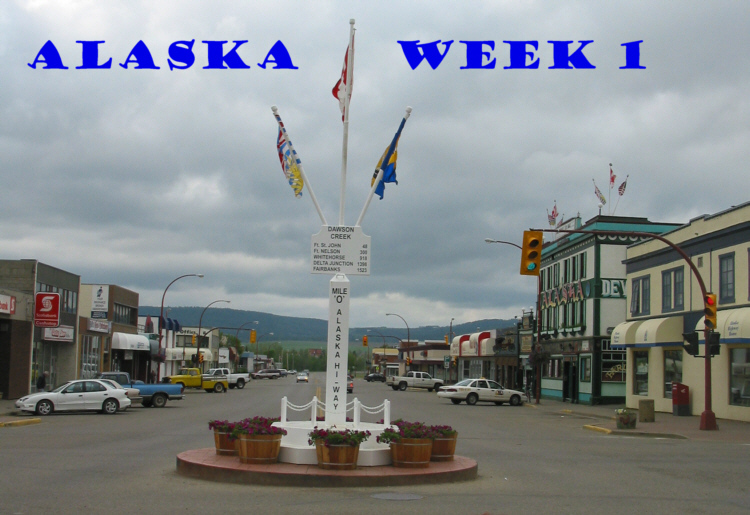 Dawson Creek - Mile “0" of the Alaska Highway ... Here we come! 9:52 Passing the airport ... we are driving on AB-43 ... Grande Prairie appeared to be fairly flat. 9:55 However, we are now starting into hills ... large lake to the right ... everything is beautifully green ... we are traveling west on a divided highway ... the topography very similar to North Dakota. 10:03 Divided highway ends ... elk farm to the right. 10.05 A flock of sheep and one llama. 10:07 Some blue sky to the north and sun is endeavoring to shine. Rather than hills the countryside is rolling - beautiful pastoral scenes as far as the eye can see. 10:13 Entering Beaverlodge, pop. 2,110. 10:14 - 10:19 The big beaver. 10:23 Another elk farm to the right. 10:25 Gas well to the right. 10:26 Cattle to the right ... grain (CARGILL) elevators to the left. 10:28 A patch of sunshine. 10:30 Drilling rig on the right. 10:31 Hythe Agricore elevators ...Nothing but gray sky - such a shame ... gas wells ... rigs ... holding tanks at intervals. 10:37 Horses ... sprinkle of rain ... more horses ... and more horse. 10:40 Forest to the right and piles of logs ... forest both sides - fir ... birch trees seem to alternate with the fir rather than mix ... have left the agricultural land behind. 10:42 High deer fence on the right. 10:45 Swamp or bog ... some nice grassy areas between the trees. 10:46 Planted forest both sides - pine. 10:50 A level railway crossing ... interesting sign for truck scales ... also as we get into the forested area the land appears to be more hilly. 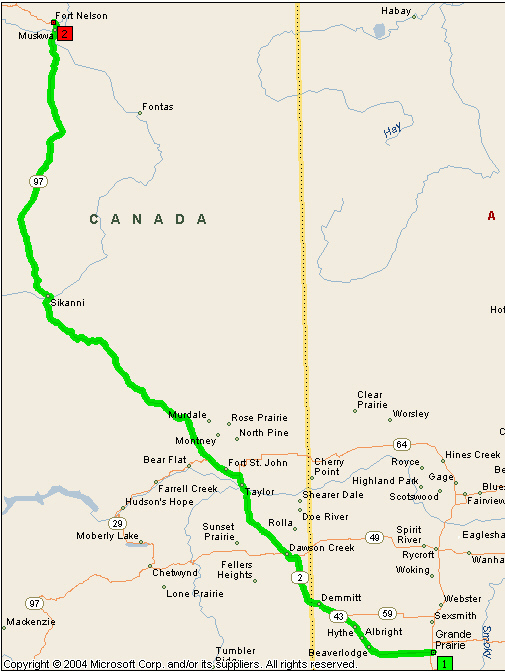 2,165.8 10:52 Entering British Columbia and the highway becomes BC-2. Also we are now in the Pacific Time so the time is 9:52. 9:53 Cattle grazing ... big lake to the right - Swan Lake. 9:58 Yellow fields of dandelions to both left and right. 9:59 A pile of logs and stacks and stacks of firewood ... the soil is brown - not as black looking as it was around Grande Prairie. 10:04 Field white with dandelion seeds ... forests are of aspen or white birch. 10:07 Top of a hill overlooking a beautiful valley. 10:09 Pouce Coupé Provincial Park. 10:10 Welcome to Village of Pouce Coupé. 10:12 Dawson Creek 10 km ... seeing some agriculture again. 10:14 Dawson Creek Regional Airport to the right. 10:16 Entering Dawson creek, pop. 10,754. Judging by the trains and elevators here a lot of grain grown in this area. 2,190.7 10:21 - 10:53 Mile “0" and start of the Alcan, original name of the road when built during WW II. We spent time by the cairn, went to the Visitor Center and walked to the main street to see the Mile 0 marker in the middle of an intersection. We are on our way! For me it is an adventure which I had never thought possible, though I always hoped that I would make it to Alaska some day, but never driving the Alcan. I shall always be grateful to Jo and Sam for making this dream a reality. 10:58 A big mill of some kind with so many piles of logs. It doesn’t have the smell of a paper mill (with research since being home, I suspect it was probably an OSB plant). 2,207.1 Plugged in my camera to recharge the battery. 11:04 Rolling countryside - farms and some forest ... beautifully green except where the land has been tilled and is brown. 11:07 Farmington Fairways - one of many golf courses we have noticed along the route ... the numerous golf courses is actually mind boggling. 11:09 Crest of a hill and looking ahead over a vast area ... lilacs in flower ... woods ... valley. 11:17 Start of long steep hill. 11:19 Crossing Kiskatinaw Bridge ... missed side road where we had the opportunity to drive the original old Alaska Highway and cross the historic curved wooden Kiskatinaw River Bridge, a 531 foot-long structure, the only original timber bridge built along the highway and still in use. Jo had talked about this bridge but Sam had not registered that we wanted to see it. He said that when we are talking it is just conversation to him! We needed to speak up! 11:24 Horses and cattle ... a lot of fields are covered in dandelions which have gone to seed - hundreds of acres of seeds. 11:26 Sheep with lots of lambs to the right, also a donkey. 2,219.5 11:27 Km 45 (28.0 miles). 11:28 Sign: Extreme Grades - Brake Check Area. 11:31 The hill ahead is in sunshine. 11:33 Welcome to Taylor ... we immediately turned off for Peace Island Park. 11:36 Turned around looking for the park. 11:38 Turning into Peace Island park. 11:43 Picture of Peace River bridge. Sign: “This is a cistern and refilled by tanker truck.”. 11:45 Crossing the causeway from Peace Island. 11:47 Out of Peace Island park. 11:48 Back at the highway and it’s raining! ... start of rise to the bridge. 11:48 Starting to cross the Peace River. The cantilever and truss-type bridge was completed in 1960. The earlier 2,130-foot suspension bridge, which was completed in July 1943 collapsed 1957 after erosion undermined the north anchor block of the bridge. Another bridge could be seen to the east, but this was for a gas pipeline - this goes to Vancouver, BC with a branch to western Washington. 11:49 Over the bridge - Taylor, pop.1,300; El. 1,804 feet ... Duke Energy Inc ... the local 18-hole, par 72 Lone Wolf golf course is the home of the world’s largest golf ball (did not see) http://www.geotourismcanada.com/documents/521.aspx ... it is pouring and visibility is poor. 11:52 Starting up the other side of the valley. 12:02 Construction as we approach Fort St. John - lots of heavy equipment. The Honey Place (did not stop) - guided tours, fresh honey for sale and the world’s largest glass beehive for viewing year-round. Fort St. John, pop. 17,000; El. 2,275 feet ... Super 8, Best Western, Wal*Mart, Zellers, Safeway ... gas $0.999/lt. (See MILEPOST, p. 127 for history of Fort St, John). 12:12 Big lake to the right - W.A.C. Bennett Dam. 12:13 Some very nice houses to the right near the water. 12:14 Charlie Lake - Duke Energy ... the rain is unbelievable and we just can’t seem to get away from it. 12:20 The road is closed in by woods, though the trees are cleared well back from the road. Sometimes we can see farms back behind the trees. 12:25 Getting up into the cloud. 12:27 West Coast Energy - gas pipeline. 12:29 Horses and some open fields and long distant view to the right. 12:32 A strong wind is blowing the trees. 12:33 Tilled field ... hilly country, but mostly not too steep. 12:36 Milepost 73 - gravel airstrip, one of four built for the American military aircraft during WW II. Lunch today consisted of Trail Bar and mix, and apple and jerky at intervals. 12:42 - 12:50 Rest Area - paved and with flush toilets. After this we were back into forests, mixed conifer and deciduous. 12:56 Reforested 1979 on the right and 1988 on the left. 12:58 Green fields both sides of the road. 12:59 A School Bus Stop sign ... Where do they take them to school?. 1:03 Duke Energy compressor station to the west (Historical Mile 92) - gas or oil tanks. Throughout many deciduous trees have been snapped off - I suspect the weight of snow causes this. 1:07 Sign for a steep descent ... a short one!. 1:12 Historic Milepost 101 ... Wonowon, pop. 150 ... Blueberry Control Gate, a 24-hour military checkpoint operated by the U.S. Army personnel throughout the war years. 1:15 Top of hill ... long straight stretch down ... The trunks of the conifers are very dark, almost black. 1:15 Historic Milepost 104 which marks the start of Adolphson, Huseth, Layer & Welch contract Alaska Highway construction - the second contract. 1:23 Glimpse through trees to the pipeline. Otherwise miles and miles of trees. 1:28 Land to the left reforested 1989. 1:30 Pipeline through the trees. Each time there is any access to the pipeline there is a big red sign: DO NOT PARK ... POISONOUS HS GAS. The HS stands for hydrogen-sulphide gas. 1:33 Top of a hill, then down again. 1:34 Crossing Townsend Creek, then up (122.9 miles from Dawson Creek). 1:36 Rock cut ... relatively few rock cuts were necessary during construction of the Alaska Highway in 1942-43. However, rock excavation was often made outside of the roadway to obtain gravel fill for the new roadbed. The Cut, and a steep downgrade. 1:47 Pine trees - not fir. 1:53 Sign: Moose for 12 miles. 1:57 Flat open area to the right. 1:58 Sasquatch Crossing - Historical Mile 147. Historic Milepost 148 - Suicide Hill ... from MP p.133 “one of the most treacherous hills on the original highway, noted for its ominous greeting: Prepare to meet thy maker.”. 2:00 Sign: “Moose On Highway” ... then another moose sign a bit further along. 2:07 Top of a hill, but I didn’t think it was a bad one. 2:11 Signs: Trucks check brakes Trucks chain up ... Then the top of the hill ... landslides in the cutting ... another sign: Very Steep Hill Ahead next 3 km (1.9 miles). Road steep and winding ... big cutting ... Sign: Very Dangerous Curve. 2:15 Stopped - one-lane bridge (2 pictures from the car window). 2:16 Crossing the Sikanni Chief River, then climbing out of the valley. See MP p.133 about Sikanni Chief River bridge..
2:17 Sign: Chains may be removed. Sign: Caution Moose on Highway. There has been an almost continuous stream of wide loads going south - a lot of portable buildings being moved. RAIN ... RAIN ... RAIN ... What a dreary day! Turnoff for Buckinghorse River Wayside provincial park. Dawson Creek 176 miles - Trutch Mountain Bypass - Trutch Mountain was the second highest summit on the Alaska Highway, 4,134 feet, before being rerouted ... see MP p. 134 for more information. 2:33 Passing the turnoff to the right for the gravel road to new provincial park at Redfern Lake - see MP p. 134. 2:35 It is raining and we are driving in fog or cloud again. What a miserable day! And my knee has been in awful pain ever since coming down the hill to the Sikanni Chief River. 2:42 Looking to the left over the top of hills - thousands of square miles of forest ... the road seems to be high with long distant views left and forward. 2:45 Another building being hauled south. 2:46 Good sized hills to the right running adjacent to the road for some distance. 2:49 Saw the hills again between the trees. Sam, “This is as much rain as I have seen since I left Alaska.”. 2:55 It looks as if the road is going to drop off the end! Can’t see anything beyond a certain distance as if the road and the grass and trees on either side of it suddenly end! 2,392.2 2:57 Welcome to The Fort Nelson Forest District. 3:00 Still have quite high hills to our right. There would be some pretty vistas were it not for the rain, fog and cloud. Miles and miles of trees, but no wildlife. 3:15 - 3:25 Turning into Prophet River Provincial Park to stretch our legs ... water holes on the right of the road. (I needed to stretch my back and relieve the pain in my knee) Wild roses in flower. 3:29 Top of hill - 8% grade ... Sign: Welcome To The Northern Rockies. 3:30 Crossing Prophet Creek, then up again. 3:32 Duke Energy sign to the right. 3:33 THE FELLS - house ... fields and cows. 3:35 Horses ... Catholic Church - Historical Mile 232. 3:35 Entering Prophet River - Historical Mile 233 ... gas station, restaurant. 3:44 Stunted looking trees both sides of the road ... Sam said that it is like muskeg. (Heritage dictionary: muskeg - A swamp or bog formed by an accumulation of sphagnum moss, leaves, and decayed matter resembling peat.). 3:46 Mount Yakatchie - mesa-like topography to the east ... lots of white flowers by stunted tree line, trees stunted because they are growing in muskeg which continues for some distance. 3:50 On a rise and the trees are much bigger - muskeg in the lower lying areas. 3:51 Stunted trees again interspersed with patches of taller trees. 3:55 A hill to the right has its summit in the cloud. 4:00 Lots of deciduous trees with some conifers mixed in. 4:03 Muskeg again ... it is not necessarily only in low areas ... many miles of muskeg. 4:10 Not raining! And the road is dry. Some of the aspens or white birch are very tall. 4:12 Large stand of aspen ... top of a hill then descending. 4:13 Crossing a creek, Jackfish Creek, with clear water, then up ... passing entrance road to Andy Bailey Regional park. 4:15 Big sign: DO NOT PASS SCHOOL BUS WHEN LIGHTS ARE FLASHING. NOTE: Sam mentioned the difficulty experienced by 5th wheel vehicles during winter months because the grease would freeze on long straight stretches and the vehicles couldn’t make the corners. They resorted to using B29 high-flying plane grease. 4:17 A hawk on the road. 4:19 Big chimney at the Fort Nelson Generating Station (Duke Energy) on the right ...Sulphur gas pipeline - sulphur pellets on left. 4:21 A big ravine to the right. 4:24 Another big ravine ... on the outskirts of Muskwa Heights, an industrial area with rail yard, plywood plant, sawmill and bulk fuel outlet. 4:26 Big sawmill on the right. 4:27 RESOURCEFUL FORT NELSON ... another sawmill, this one to the left. 4:28 OSB plant on left (processes aspen and balsam poplar) ... lilacs in bloom. 4:29 Fort Nelson First Nation ... and start downhill, then large curve. 4:30 Crossing the Muskwa River, lowest point on the Alaska Highway, 1,000' then the highway ascends to Fort Nelson - see MP p. 136 for history of. 4:32 Fort Nelson business area and sign: Welcome to Fort Nelson, pop. 5,055. 4:35 - 4:46 Visitor Information center. For history of Fort Nelson see MILEPOST pp. 136-138. 4:53 Fort Nelson Motor Hotel ... we decided that it was too wet for camping and besides the tent was wet from last night! 5:53 Unpacked and leaving .. We had draped tarpaulins and tent around in the bathroom, also wet shoes and we opened up Sam’s and my wet sleeping bags. We went for supper at the Shangri-La Restaurant (C$15.00 for me). 6:56 59° as we leave the restaurant ... drove around town a bit ... I wasn’t much impressed! 2,484.3 7:13 Back at the hotel ... end of the day.